In this tutorial you will learn the way to link text in XML Flash template. 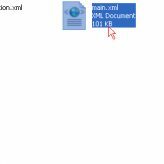 1) Open folder "XML" and locate your XML file – "main.xml", Use any text editor to open and edit it. 2) You will be able to locate text to link easily with your text editor search function or just browse XML file and find it, the pages sections are easy to find and start with pages titles. This entry was posted in Working with XML Flash, XML Flash Template Tutorials, XML Flash Templates and tagged flash, link, text, XML. Bookmark the permalink.